Ghost of Tsushima as one of the best E3 games and here is why it stands out to me from this year's event. We saw some amazing footage of Ghost of Tsushima at E3 2018. Since the show I have been thinking back to the moment I saw the gameplay and it really stands out as one of the best of the entire E3 show. We are going to Ghost of Tsushima on PS4 at some point, but sadly we have no idea when as yet. Here are 6 reasons why I love the look of this game by Sucker Punch. 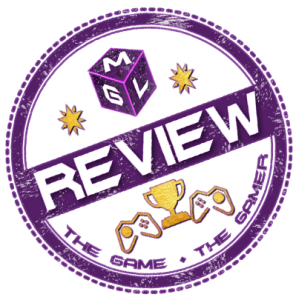 Below find out the reasons I think this could be one of the best open-world games on the PlayStation when it arrives. Plus, this article includes videos, images and some information on the game you might find useful! 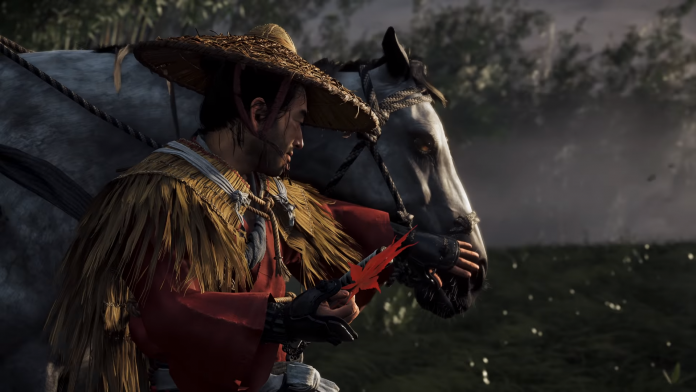 Why the focus on Ghost of Tsushima? We all picked our favourite Games of E3 2018 (awards here) and this was one of my choices! The team have done more articles like this, check them out in our E3 2018 Hub here. Sucker Punch are no slouches when it comes to their art. I’ve only ever played through “inFamous: Second Son” once (I think) around launch, but I recall leaving the slums with Delsin, hopping over some stones in the water and catching a glimpse of the Seattle sunset. “This is what they mean by next-gen”, I thought to myself. 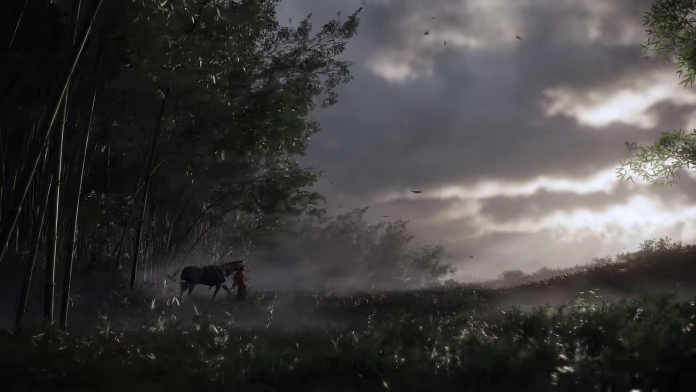 Ghost of Tsushima is not only a worthy successor to that moment; it surpasses it in every frame. Watching that E3 trailer, every second heightened my anticipation. The realistic sway of the trees under siege from fierce winds. Even the cloud formations above our protagonist and his horse as the trailer begins: it’s that attention to detail that entices me the most. And what makes Ghost of Tsushima the perfect show-piece for events like E3. 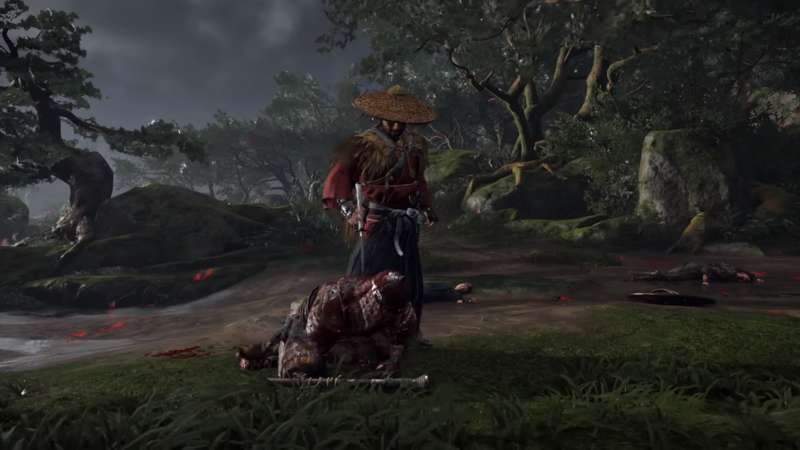 At first, I thought the combat in the E3 trailer for Ghost of Tsushima looked stilted. Upon revisiting the trailer, it appears very deliberate. The first scene where Jin takes on a group of three Mongol soldiers and their two reinforcements, well, reinforced just how important every movement seems to be. It appears to rely on evasion, parry and one-hit kills or short combination moves that result in enemy evisceration. It seems brutal but realistic and the attack animations are as fluid as anything I’ve ever seen. The stealth mechanics shown later in the trailer seem effective, if similar to the myriad of stealth games we’ve played over the years. Still; it’s hard to nail the feel of that exactly right, but I think Sucker Punch has earned our trust with their gameplay in the past. Shortly after the public presentation of Ghost of Tsushima, the people at E3 were able to talk with the director of the game. Nate Fox (director), from what I’ve heard, was willing to field any and all questions in regards to the game. At one point, it came to light that the video shown at E3 was a side-quest. Just think about that for a second: all of that scenery, those deep character moments and the climactic finish – all of it, just for a side-quest. Not since The Witcher 3 has it felt like a team really cared for everything in the periphery as well as the core. Granted, at this stage, it’s hard to tell if this will backfire and the main plot-line falls short of its surrounding excellence – that could happen – but if every side quest turns out to be as engaging as that demo, I couldn’t be happier. He may not be Spider-Man, but Jin’s still swinging his way into our hearts and minds come 2019. My appreciation of the grappling hook at this stage stems more from what it could mean rather than what has been shown, but I’m still excited about the possibilities. For instance, the use of the grappling hook – if not limited to specific missions – could expand Jin’s freedom of movement to allow for multiple entry points into any given area. Sort of a “play your way” philosophy that’s common in Sucker Punch’s previous games. If that wasn’t enough, imagine if the grappling hook could be used as a weapon for stealthy take-downs from distance! I really hope the grappling hook is the main feature and not an after-thought, but time will tell. Again, we only have a single clip to go on right now, but that final stare-down between Jin and Masako, shadows flare in the setting sun with arrows of fire raining down from above, gave me genuine chills. It goes to show that not everything needs to be a God of War-esque fantastical showdown between power-houses. Those moments would be nothing without stellar execution and I trust Sucker Punch to achieve that. They’ve shown that much here, at least. Not only that, the acting and the animation made me feel for the two. The struggle of Jin – allowing the treacherous monk to leave, knowing that it’ll upset Masako. Masako – so hell-bent on vengeance that she’s willing to fight Jin, and admits defeat at the hands of the Mongols. That brief moment delivered a lot in regards to who these characters are and what they value at this point. I can’t wait to take a deeper dive into the game. Some of the best reveal not only show you something spectacular to enjoy. They also leave you with so many things to be answered. Think about it, they showed a side-quest in action. A hint of some combat including stealth, some general action and a bit of a confrontation. But mainly we were all hypnotised by the blowing red leaves! Not to mention Jin’s horse. One impressive beast. But what of the story is going to come out next? We know it’s of the Mongol invasion and the Samurai are massively outnumbered. What exactly will your objectives be and where else will this stunning world take us. InFamous games really did deliver great stories, particularly the first two games. I really do wonder what is to come from Ghost of Tsushima. Let’s hope Sucker Punch have some more details on the game later this year. Will you be getting Ghost of Tsushima? Since you are here, did you like Ghost of Tsushima at E3? If so let me know if you are going to be getting it when it comes out! A simple, “Yes” or “No” in the comments below would be awesome.